2017 will be remembered as a landmark year for Lamborghini. Not only has it been one of its strongest selling years so far with 2,091 cars sold in the first half, but 2017 also marks the year that the Italian automaker will be lifting the lid off the long-awaited Urus, Lamborghini’s first SUV since the long-forgotten LM002 from the 1990s. We’ve known for some time that Lamborghini is planning to reveal the Urus sometime in December, but now we have an official date thanks to a new teaser trailer. The trailer shows a montage looking back at some of the most defining models of Lamborghini’s history such as the Miura, Countach and LM002 SUV, touting their “futuristic designs” that pioneered "new roads" before revealing a sketch of the upcoming Urus. Its sporty silhouette suggests that the design of the final production model won’t differ too much from the initial concept that debuted five years ago at the 2012 Beijing Auto Show. No further information is given about the Urus, but we’re expecting the Lamborghini SUV to be powered by a twin-turbo V8 packing around 650-hp, with a plug-in hybrid to follow at a later date. Despite its supercar performance, Lamborghini isn’t using the Urus to chase Nurburgring lap records, instead pitching it as a premium family SUV. The Urus may not be a supercar, but it will be one of the most important models to join Lamborghini’s line-up in years, as it’s expected to double the company’s annual sales. 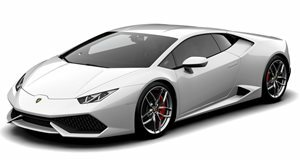 Prices are expected to start at around $200,000, which isn't far off the Lamborghini Huracan. Lamborghini isn’t the only supercar maker succumbing to the SUV bandwagon either, as Ferrari is already working on its own SUV (sorry, FUV) to rival the Urus.